[Limbaugh denies. See update below.] For the second time on Monday, MSNBC cited a dubious "quote" from Rush Limbaugh in which the conservative radio host supposedly said that "slavery had its merits." The source? A linebacker for the Pittsburgh Steelers. Discussing Limbaugh’s interest in owning the St. Louis Rams, News Live host David Shuster asserted that "James Farrior says Limbaugh should be denied the privilege of owning an NFL franchise for comments like ‘slavery had its merits.’"
An onscreen graphic appeared that read "Limbaugh remarks: Slavery ‘had its merits.’" In the bottom corner of the screen, the citation is simply this: "Cited by James Farrior Pittsburgh Steelers." So, that’s it? A linebacker for the Steelers says something and that’s enough for MSNBC? MSNBC featured the "quote" earlier in the day on Morning Meeting. It can be traced to liberal author Jack Huberman, who featured the remark in his 2006 book 101 People Who are Really Screwing Up America. The tome is available on Google Books and the statement appears on page 232 with no air date mentioned. It’s also next to a "quote" in which the author asserts Limbaugh called for the Medal of Honor to be given to the assassin of Martin Luther King. Does anyone really believe that remark was ever uttered by Limbaugh? Instead of asking for proof, co-host Tamron Hall repeated the line to columnist Stephen A. Smith: "Should a person who says there are merits with slavery be able to have this privilege of owning a team?" Hall even compared Limbaugh to former Cincinnati Reds owner and Hitler-sympathizer Marge Schott. After asserting that no one has the right to own a NFL franchise, she fretted, "And they have denied people ownership and we've seen it in Major League Baseball with Marge Schott after she said slurs about African-Americans, Jews, the list went on." 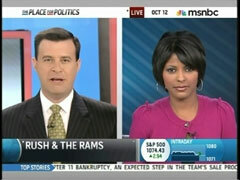 TAMRON HALL: Well, the NFL Players Union wants to block Rush Limbaugh. DAVID SHUSTER: Tamron, the union trying to derail his bid to buy the St. Louis Rams. In an E-mail to players, the union chief writes, "Sport in America is at its best when it unifies, gives all of us reason to cheer and when it transcends. Our sport does exactly that when it overcomes division and rejects discrimination and hatred." Limbaugh first expressed interest in owning the team this spring. An NFL spokesman says the Rams have not agreed to sell to anyone and that there are other bidders. Meantime, the Pittsburgh Steelers linebacker James Farrior says Limbaugh should be denied the privilege of owning an NFL franchise for comments like "slavery had its merits." 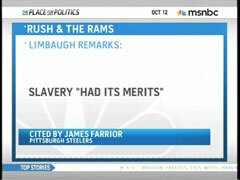 [Onscreen graphic reads Slavery "had its merits" and also "Cited by James Farrior, Pittsburgh Steelers.] And Fanhouse.com columnist Kevin Blackstone says the NFL should punt Limbaugh's bid for remarks like, "The NFL all too often looks like a game between the Bloods and the Crips without any weapons." He also cites Limbaugh’s suggestion that Philadelphia Eagles quarterback Donovan McNabb was overrated by sports media concerned about looking politically correct. And he cites other Limbaugh remarks, including of President Obama: "Adolf Hitler, like Barack Obama, ruled by dictate." Of Michael J. Fox's suggestion- struggle with Parkinson's Disease, "He’s moving all around and shaking and it's purely an act. And of a black caller to Limbaugh’s radio show, Limbaugh said, "Take that bone out of your nose and call me back." Joining us now from Philadelphia is journalist and commentator Stephen A. Smith. Stephen, I’m told that you actually support Rush Limbaugh’s bid to own the St. Louis Rams. How come? STEPHEN A. SMITH: Well, it’s not a matter of supporting it. I just don’t have a problem with it. The fact is, that he earned his money the old fashioned way, he worked hard for it. He’s got the dollars and if he has an opportunity to purchase an NFL team, I don’t see a problem with it. If the players themselves, if the exclusive director, if the players association wants to speak out against it the way he has, I applaud that as well, because, a lot of African Americans should be very, very sensitive to some of the racially insensitive things and nonsense come out of his mouth. But, still and all, at the end of the day, you are an American citizen, you work, you pay taxes, you earn your paycheck, you have got an opportunity to purchase an NFL team. To say that he doesn't have a right to own a team because of those remarks, to me, I think is going a bit too far, especially when players themselves have done very, very little to exhibit any kind of political conscience whatsoever up to this point. SHUSTER: Well, if they did that now, and suppose a big group of players said, "You know what? That’s fine, we can he can play for the Rams." And you have a large number, would you support the players in that large effort? SMITH: Absolutely. I don't have a problem with it. If you don’t want to play for him, don't play for him. But, believe me when I sit here and tell you, I think it's a bunch of crap that they are sitting there talking about that is something they wouldn't do. I don't believe them. It’s just walking hypocrisy as far as I'm concerned. There is no way on Earth you can tell me that if Rush Limbaugh had $20 million to give you as an NFL player, but someone else on one of those 31 teams in the NFL only had $10 million to offer you that you gonna pass up that additional $10 million. Let people believe you are Boo-Boo the Fool all you want to, I'm not going to get caught up in that game. I don't believe a single word coming out of their mouth when they say that. HALL: Well, Steven, you certainly have your right to do that, but owning an nfl team is not a right, a privilege. HALL: And they have denied people ownership and we’ve seen it in Major League Baseball with Marge Schott after she said slurs about African-Americans, Jews, the list went on. And she was obviously was a Hitler sympathizer as well. So, it is not a right, a privilege and we don't have to talk about the players what about the fans? What about the African-American kid who wants to go see a team that's owned by a man that tells a black person to get the bone out of his nose? What about those people? Don't they have a voice and many of them are speaking out? So, whether you believe the players or not, isn't it also about the fans? HALL: But everybody is not fueled by money. I mean, my mother has a saying, "Not all money is good money." And I do think that we are at a time of bravery where people might- I don't want to make assumptions about anyone- It is really about should this individual own a team? Should a person who says there are merits with slavery be able to have this privilege of owning a team? SMITH: I think that before you answer that question or before you answer that question, what you should ask yourself to a person like that be allowed to have his own nationally syndicated radio show that's disseminated to more than 15 to 20 million people, depending on what reports you read? Here we are saying that this man does not have the right to own an NFL team but he has a right to be over FCC airways. SMITH: I'm answering your question. HALL: Well, I'm asking you the questions here. SMITH: I said I'm answering your question. HALL: Oh, Okay, I thought you said I'm- We’re not- David and I are not saying he doesn't have the right to do so. We’re saying, the NFL picks and chooses. Should this be one they pass on? That’s the question. SMITH: It should be one to they pass on if they have another viable candidate who has the same amount of money. But if this guy and his group which includes Dave Checketts and others who have not made such incendiary remarks puts a group together that says they can afford to own an NFL team and it can be very, very pro profitable and affluent for the very players that will ultimately come to play for them, I simply do not have a problem with it. If you want to sit there and be the executive director of the NFL and you want to say this guy should not be a part of our league but you got somebody that can purchase the team that has these hundreds of millions of dollars to get it done, then so be it. But if you don't, don't whine and moan about it, when, clearly, there have been far too many occasions where players should have stood up and had a political conscience and refused to do because of public sentiment or because of sentiment that may have come from the ownership group or upper management or the public at large. You picking and choosing when to be in an uproar over such things. And I'm saying there's many occasions they could have spoken out in the past and they didn't do so. SHUSTER: Stephen A. Smith, we appreciate it as always.